Harald Tunheim crossed the finish line at 07:48 Tuesday morning and won a most convincing and historic victory in the FL-500 race. 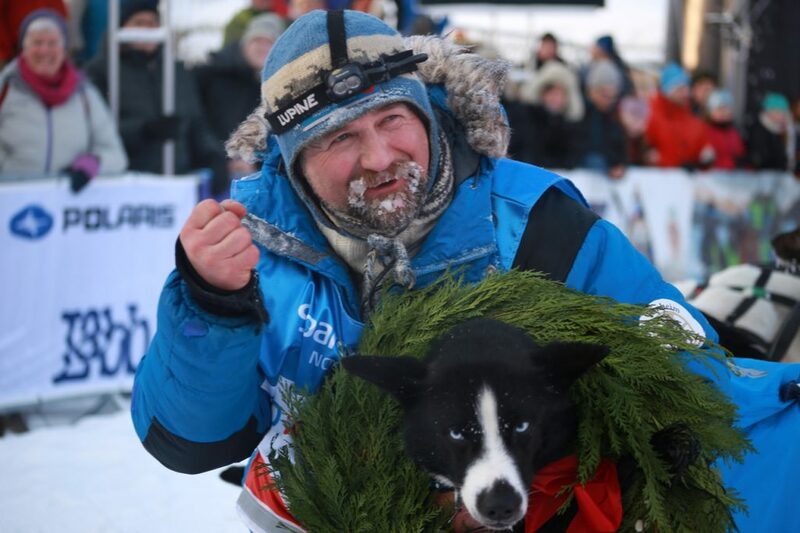 No other musher can count victories in Finnmarksløpet through three decades – but Harald Tunheim can. He won the FL-1000 race for three consecutive years in the 1990s (1996, 1997, 1998), then twice in the early 2000s (2006, 2008). 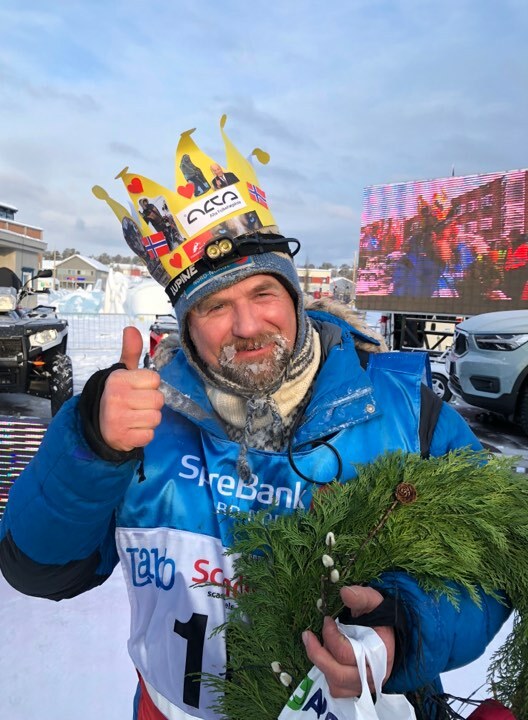 Today’s victory in the FL-500 race has lead him to win through three decades and he has completed a total of 21 Finnmarksløp. That is nothing but outstanding! Harald Tunheim is one of the Grand Old Men of Finnmarsløpet and long distance mushing in Norway. He could have retired with an outstanding CV and track record following his many achievements in the FL-1000 race, however, instead he chose to participate in the FL-500 race – a move bringing even more honor through today’s victory. 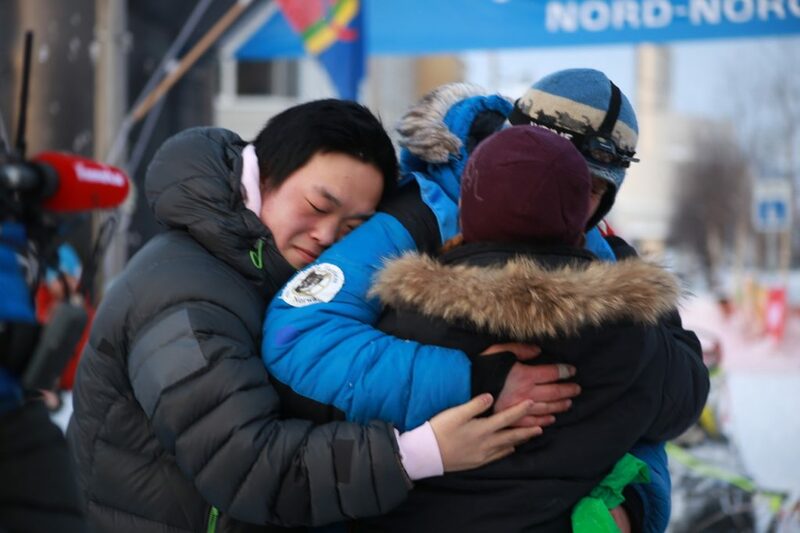 His children congratulated him when he had crossed the finish line. His son Martin was a participant in the FL-junior race this year and finished 12th. Tunheim has caught up with his opponents one by one, ever since starting the race in Alta last Saturday. He started as #66 out of 69 participants in his race (FL-500). 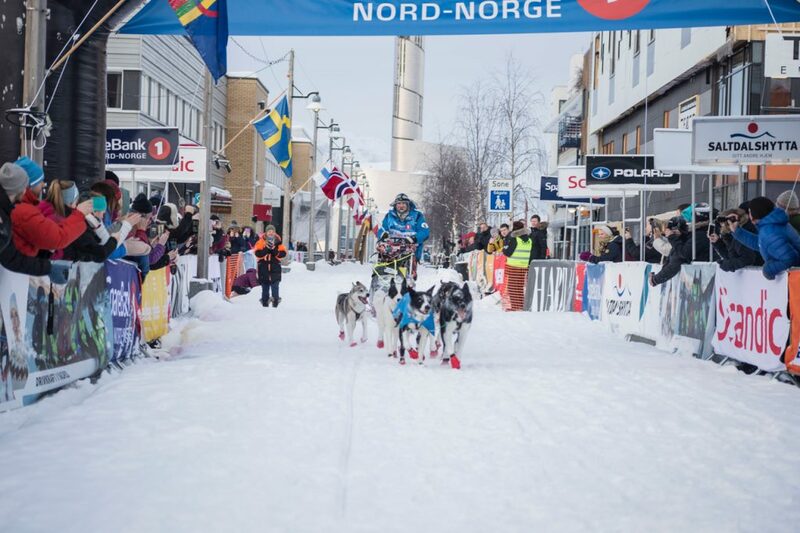 After 200 of the race’s 565 kilometers, he arrived as #7 to cp Kautokeino. One checkpoint later, at Jergul, he was #2, only second to Elisabeth Edland. When she had to call it quits, the way to the top of the list was paved. And through the final stages of the race, Tunheim has increased the distance behind himself and his closest competitors. Through the final third of the race, along the 177 kilometers from Valjok to Alta, there has hardly been any doubt: Tunheim has been in the lead, and no one could challenge his position. It stayed like that until he crossed the finish line, winning a most convincing victory. – It has been a fabulous race, Tunheim said upon finishing the race. – I have had a plan and stuck to it, and I had a strong team this year, he said. – There has been a partially new trail and new checkpoints along the way – great fun! When asked where he finds the strength to keep going on such a high level for so long, Tunheim responded that it is all about finding ‘your thing’ – finding something you enjoy doing and something that fits in to your everyday life schedule. And he has no plans to retire: – No, I have finished 21 races now. Roger Dahl has finished 25, so my next goal is to catch up with him, Tunheim said with a smile. – After that, I’ll take a look at Engholm! Sven Engholm can boast 11 victories in the early years of Finnmarksløpet. If Tunheim stands by his word, it means we will still see him around for many, many more years on the trail.